Aja Daniell Johnson, 7, is missing. Her mother's body was found in an RV on Sunday night. (CNN) -- Investigators continued their search Tuesday for a 7-year-old girl who was reported missing after her mother was found dead in Oklahoma. 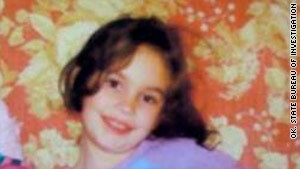 "We've got to find that little girl," Special Agent Ray Homer of the Oklahoma State Bureau of Investigation said. "We're doing what we can." The girl -- Aja Daniell Johnson -- was reported missing from Geronimo, Oklahoma, late Sunday, the bureau said. Her 37-year-old mother, Tonya Hobbs, was found dead inside a parked RV. They also are trying to find the dead woman's estranged husband, Lester William Hobbs, 46, the bureau has said. Lester Hobbs and Aja are presumed to be in Hobbs' car -- a white 1992 Toyota Paseo with Oklahoma tag No. 577-BPW, police said. Police were looking for Hobbs and Aja in Oklahoma and Texas. Authorities were working with the National Center for Missing and Exploited Children on Tuesday to set up a toll-free phone line and put Aja's photo on a Web site of missing children, Homer said. They have had no communication with Lester Hobbs or anyone else that would indicate Aja's location, he said. Tonya Hobbs and her daughter visited Lester Hobbs at his sister's home, the bureau said. Lester Hobbs is not Aja's biological father, police said. Texas authorities also issued an Amber Alert, Texas Department of Public Safety spokeswoman Lisa Block said. Authorities believe Hobbs has connections to Rockport, Texas, and the alert was issued preemptively, she said. Tonya Hobbs and her daughter were last seen Saturday night. Authorities did not say how Hobbs died, but the bureau said investigators believe someone killed her. The RV belonged to Lester Hobbs and was parked at his relatives' home, Richard Goss, agent in charge of the bureau's Lawton, Oklahoma, office, told reporters. Hobbs' relatives became suspicious Sunday after they did not see Tonya Hobbs or Aja. One of them pried open the RV door and discovered Tonya Hobbs' body, he said. Lester Hobbs and Aja were gone, Goss said. The Hobbses were separated, but apparently Tonya Hobbs was visiting Lester Hobbs in an attempt to reconcile, Goss said. The couple had been together for about five years. The Comanche County, Oklahoma, Sheriff's Office said Aja has a medical condition that requires medication. "Our main concern at this time is to find the little girl," Comanche County Sheriff Kenny Stradley told reporters. "We know that she does need some medication," and authorities were checking leads regarding that, he said. He did not specify Aja's medical condition. Goss said Lester Hobbs has an extensive criminal history, but did not elaborate. The sheriff's office said he had prior felony convictions. Lester Hobbs was supposed to appear in court in Lincoln County, Oklahoma, on a DUI charge, Goss said, and did not appear, so a warrant has been issued for him. Aja's biological father was awarded emergency custody of her in November, according to Oklahoma County District Court documents obtained by CNN affiliate KWTV of Oklahoma City. At a hearing, Tonya Hobbs -- identified as Tonya Dunkin in the documents -- and the girl's father, John Johnson, agreed that she would have supervised visitation with Aja and keep the girl away from Lester Hobbs, the documents said. Aja is 4 feet tall and weighs 59 pounds, Goss said. She has brown eyes, and her hair is brown with the ends dyed black. Lester Hobbs is about 6-foot-1 and 190 pounds, with hazel eyes and brown hair, according to the Oklahoma State Bureau of Investigation. The agency released a picture of him and said he has a mustache but no longer has a goatee. Geronimo is about 12 miles south of Lawton, Oklahoma, in the south-central part of the state.